Degas followed a long line of European artists who were enamored with pastels. In his works Leonardo da Vinci used black and red chalk with yellow pastel highlights to complete a portrait drawing of "Isabelle d'Este, Duchess of Mantua" in 1499. 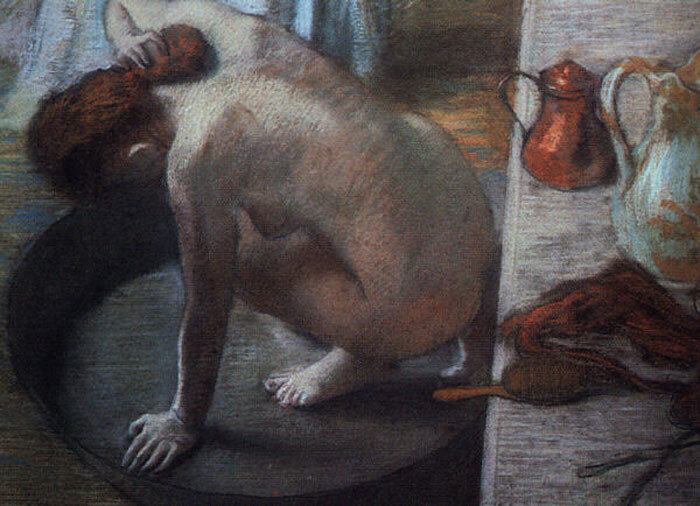 Degas was among many working in pastel during the late 19th and early 20th centuries -''The Tub, 1886''. Other pastel painters include Edouard Manet, James McNeill Whistler, Mary Cassatt and Odilon Redon. SPECIAL NOTE : The painter will make the reproduction as close to the original oil painting as possible. If you want your painting to alter from this likeness, please email us and " The Tub, 1886 " will be reproduced according to your special requirements.